It’s increasingly clear that descriptive representation matters, particularly as related to race and gender. 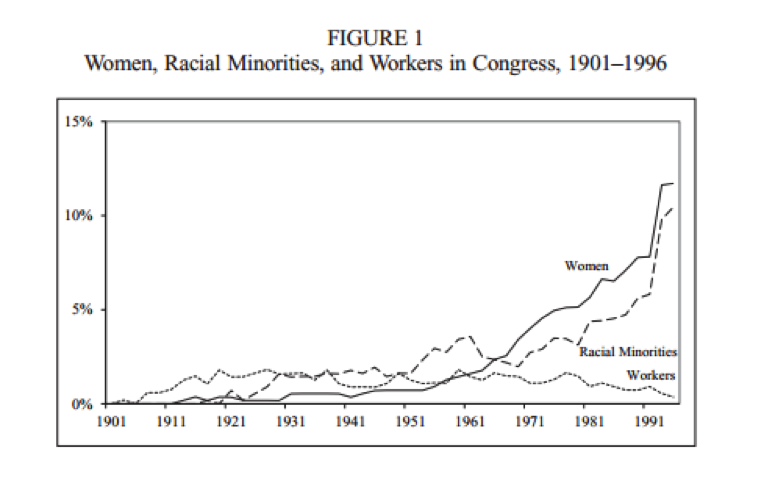 Political Scientists Robert R. Preuhs and Eric Gonzalez Juenke find that black and Hispanic legislators are more responsive to the interests of black and Hispanic constituents than white legislators, after controlling for party. Legislators of color also serve an important veto function -- preventing laws from passing that would disproportionately harm communities of color. 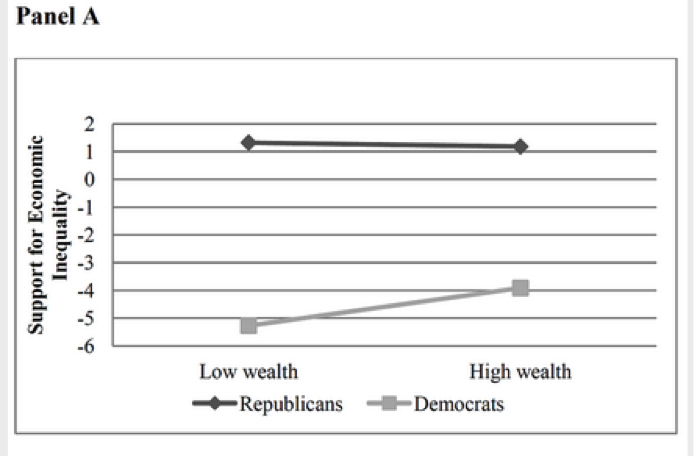 Daniel Butler and David Broockman find that politicians are more responsive to letters from constituents of the same race. This is confirmed by a study that finds legislators that support voter ID laws are less likely to respond to inquiries from Latino constituents. Further, black legislators are also more likely to hire black staffers. In addition, Economist Ebonya Washington finds that having a daughter makes a congressperson more liberal, particularly on reproductive rights. Some studies suggest that female representatives are more likely to set an agenda around women’s issues. Those data end in 1998, but Carnes maintains his own database using similar metrics that picks up again in the mid-2000s. He finds that the line has remained flat, or if anything declined. At the state and local level, the picture isn’t much better. According to the National Council of State Legislators, the share of legislators who worked in business in a non-managerial position (i.e., workers) has declined from 4.4 percent in 1976 to 2.8 percent in 2007. It is therefore clear that we need more workers in office, but what will the impact be for the gains of women and people of color? Carnes finds that we can have our cake and eat it too. 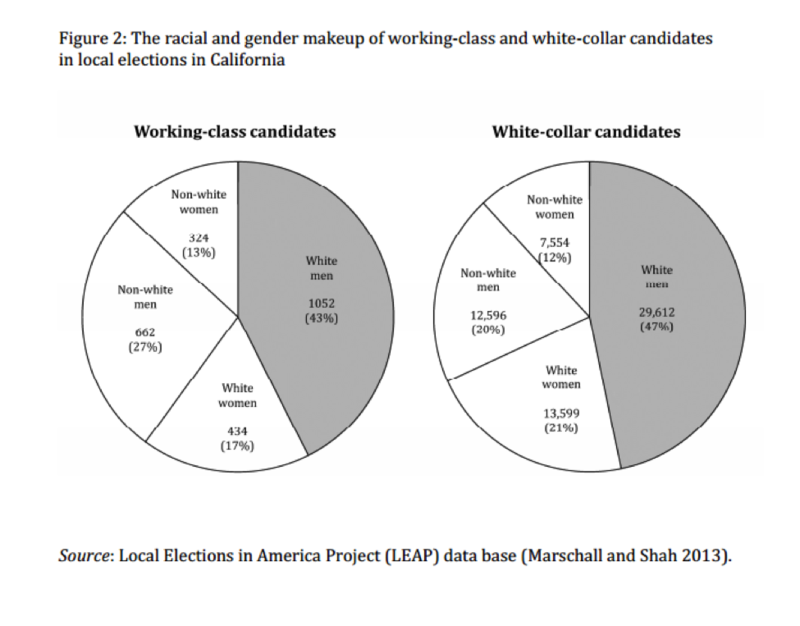 Using the Local Elections in America Project (LEAP) database of 18,000 local and county elections in California, he finds that working-class candidates are less likely to be white men that white-collar candidates (see chart).